Clamptastick!- Was born to give its users the most flexible, functional, phone mount solution that is versatile and used in many of life's applications. This kit provides high quality components utilizing ultra long lasting camera accessories made from mostly metal and high grade plastic. The metal crab clamp can latch onto surfaces up to roughly 1.5 inches wide, which means when you tighten this clamp down, it will not fall off over time from heat or drying out. The Aluminum ball head is made to hold 5 LBs and provides 360 degrees of viewing while keeping your phone locked in place at any angle. The alligator clamp that holds the phone can be separated and used on your desktop for a video call or to keep your phone right in view. These components can be used separately to add more functionality to your life. Whether you're a professional driver, executive, college student, videographer/ photographer on the go mom, you'll find there is an application where this clamp will serve you and exceed your expectations. Add this clamp to your cart and have a Clamptastick Day ! *****( Works in Horizontal mode ONLY on rear view mirror)***** Clamptastick is a large lightweight heavy-duty clamp that holds your phone in one place. Now you can finally release your phone in one second with just a quick squeeze. 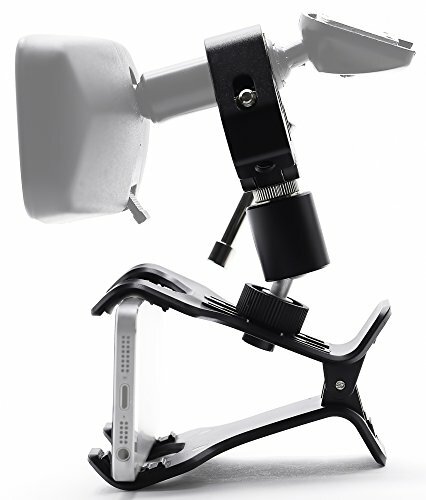 Made from 80% high quality metal components, which included a 360-degree high quality aluminum ball head, aluminum alloy clamp, and heavy duty, thick, durable, long lasting phone clamp. This Clamp can easily be removed from you car and mounted on a bicycle, selfie stick, tripod, office desk, a tree branch, baby stroller, four-wheeler, golf cart, and anywhere else. You're only limited by your imagination. Clamptastick can be used in conjunction with small cameras many GPS models weighing up to 5 lbs. and a width of 5.5 inches. This includes but not limited to Canon, Nikon, GoPro, Sony, etc. If you have any questions about this product by Clamptastick, contact us by completing and submitting the form below. If you are looking for a specif part number, please include it with your message.